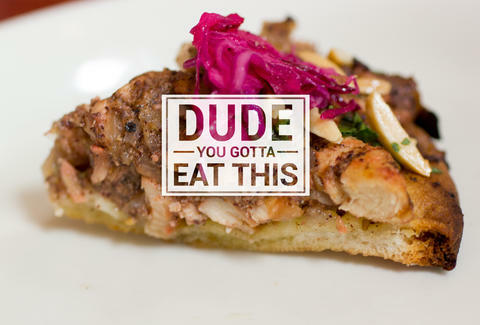 Welcome to Dude, You Gotta Eat This -- a new Thrillist series where we direct your eating attention toward new, under-the-radar, weird, or just plain awesome eats you need to go try around NYC. Check out past Dude, You Gotta Eat This-es right here. Pizza is probably your favorite food (top three, at least) and of all the dishes available at bright, airy Tanoreen, owner Rawia Bishara’s musakhan comes the closest. A Palestinian classic, musakhan consists of roast chicken, onions, and pine nuts served over taboon, a type of flatbread. At this venerable Bay Ridge classic for Levantine cuisine, it comes out in the ideal size of a personal pizza, the taboon is crusty, well charred, and holds together well. Which is always important unless you love delicious chicken falling into your lap. Bishara pulls that surprisingly moist chicken into more manageably sized chunks and subs out the pine nuts. But she shows no restraint with the sumac, which gives it an I’m-not-waiting-for-this-to-cool fragrance and lends a distinctive tart, lemony flavor to the otherwise meaty, pizza-like dish. Chris Crowley is a journalist with an overzealous appetite. His work has appeared on Grub Street, Serious Eats , Punch, Narratively, and more. Follow him on Twitter.